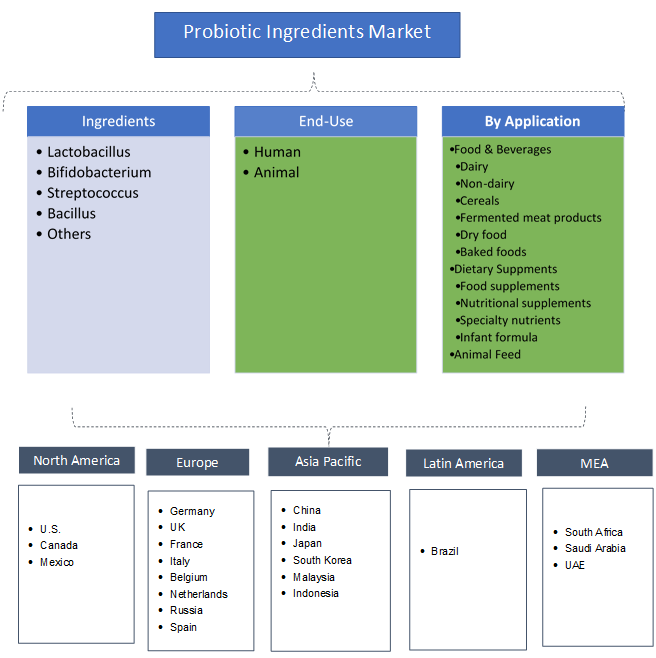 Probiotic Ingredients Market size was over USD 1.8 billion in 2017 with significant gains at over 7% over the forecast timeframe. Increasing functional food demand with rise in nutritional health benefits should drive market growth. Probiotics are beneficial bacteria which are widely used to treat neurological disorders, digestive issue and mental illness. As per digestive health experts analysis, digestive cancers constitute about 25% of all cancer related deaths in the EU in 2017. Also, it is recorded about 55% of men and 45% of women aged 18 and above are overweight in the same year. 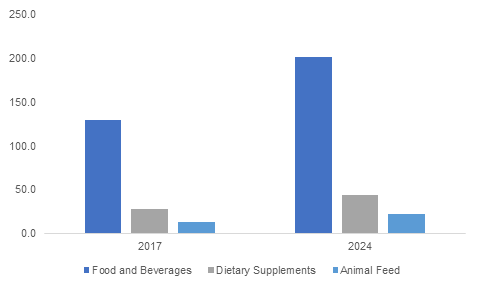 Growing demand for dietary supplements and food & beverages along with increasing consumer health consciousness contributes significantly for industry growth. Increasing geriatric population coupled with adults trying to maintain their digestive health, will increase the probiotic ingredients demand. Increasing investment in agribusinesses such as poultry and swine farming along with government initiatives to encourage agriculture due to need for maintaining health & nutrition of the livestock is likely to boost industry growth. Global meat consumption was around 75 pounds per person and Asia Pacific poultry meat consumption accounted at over 65% of the total market share in 2016. Increasing demand for broiler chicken from rural areas to balance cost along with protein and better diet intake may propel probiotics market demand. Increase in bakery goods demand due stability and elasticity properties, should drive probiotics market size. Germany bakery product market was valued at over USD 17.5 billion in 2017 owing to increasing consumer demand in bakery products. Dairy products have been increasing in recent years, driven by shifting preference of consumers towards food & beverages with functional benefits. In 2017, global dairy market size was valued at over USD 410 billion. Various benefits such as increase in calcium absorption, fibre enrichment and mouthfeel enhancement in the body along with rise in consumption of yogurts, frozen desserts and drinkable dairy smoothies will boost probiotic ingredients market demand. Technological hurdles are the major limiting factors for product demand. Complex testing methods and selection criteria of strain during the production and development process may hamper probiotic ingredients market demand. Various convention methods are formulated to determine the bacterial level. Probiotic ingredients market size from lactobacilli strain was valued at over USD 1.2 billion in 2017. Increasing demand for non-pharmacological treatments owing to lower cost may stimulate market demand. These are incorporated in dairy products as they make it easy to digest than regular milk for lactose intolerance individuals. These bacteria in dairy products lessens the threat of cardiovascular diseases, thereby driving product demand. Probiotic ingredients market size from bifidobacterium may register gains close to 6% by the end of foreseeable timeframe. It consists of high level of microbial carbohydrates which exhibit tumour suppressing activities which act as anti-carcinogenic effect stimulating product demand. Increase in meat & meat products consumption has led to rise in demand for high quality meat products which may favour industry growth. Probiotic ingredients market size from bacillus strains may surpass USD 180 million by 2024. Growing demand for preventive health care has led to the increased adoption of functional food products such as fortified oats & cereals which may promote overall industry growth. Human probiotics market size may register significant growth at over 6.5% up to 2024. These are widely used in several food & beverages, fermented meat items and dairy & non-dairy products to boost immunity and recover digestive health. Increasing disposable income along with increasing consumer awareness towards health products to stay fit may stimulate industry growth. Animal feed probiotics ingredients market demand was valued at over USD 140 million in 2017. These products are prominently used in swine, poultry and ruminant nutrition as they support intestinal morphology and gut balance throughout the production cycle. They also offer gastrointestinal relief and supports the daily needs of cats and dogs to help maintain their active lifestyle, thereby boosting industry growth. Probiotics market size from food & beverage application may register gains close to 6.5% in the foreseeable timeframe. Increasing health concerns along with rising demand for functional food & beverage products such as fruit juices, nuts and soy products may stimulate industry growth. They are extensively used in dairy beverages such as kefir to conduct immunoregulation & reduce cholesterol levels. Probiotic ingredients market demand from non-dairy products application was valued at over USD 15 million in 2017. Increasing problems of lactose intolerance such as abdominal cramps, bloating, diarrhoea gas, and nausea may stimulate usage of probiotic ingredients market demand. Rising adoption of dairy-free and vegetarian diet may increase coconut yogurt, miso paste, sauerkraut, tempeh and kombucha demand, which help regulate blood glucose, treat gastrointestinal disorders, and heart health. Probiotic ingredients market demand from dietary supplements application may surpass USD 260 million by 2024. It results in increased digestive health, improved bowel regularity, enhanced skin benefits and strengthened immune system. Innovative product offerings by manufacturers, easy availability and high effectiveness may further stimulate growth. North America, driven by Canada and the U.S. probiotics ingredients market size may witness growth at over 6% by 2024. Increasing dairy product consumption and the natural propensity to consume supplements may drive the regional industry growth. Increasing consumer awareness on healthy lifestyles and higher interest of middle-aged people to maintain optimal digestive health will propel product demand in the region. Europe led by France, Spain, Italy, and Germany market size exceeded USD 630 million in 2017. Rise in convenience food adoption accompanied with increasing health consciousness may support the demand for breakfast cereals in the projected timeframe. The region is witnessing a rise in demand for animal nutrition products owing to increasing animal husbandry activities. Moreover, increasing health awareness and growing preference for preventive healthcare may stimulate regional industry growth. Asia Pacific led by India, Japan and China probiotics market demand should witness significant gains at over 7% by 2024. Rise in hectic lifestyles has led to change in dietary patterns which has increased the prevalence of diseases such as coronary heart diseases, obesity and diabetes. Rising demand for improving personal health, adoption of proper diet and avoiding hefty healthcare bills has led to increased usage of functional food which may further stimulate product demand. Global probiotic ingredients market share is moderately fragmented in nature with top five companies comprising about 40% of the total market share in 2017. Danone, Yakult, Nestle, and Chr. Hansen are the key industrial participants. Shifting focus towards R&D to develop more efficient product in order attain point of difference is among the key strategy. Potential application in skin treatment products will create new functionalities in the industry. Most of the companies are adopting strategies like partnerships, and mergers & acquisition to strengthen new product portfolio and technological , which will further expand regional presence to gain completive advantage. They are used in functional foods as they offer health benefits and is rising rapidly owing to increased awareness of the consumers regarding the impact of food on health. These products act as driving force in the booming digestive health supplement feminine, oral and skin health. Probiotic ingredients are used in dietary supplements and in different forms of tablets, capsules, powders and liquids in measured doses. Dietary supplements increase lactobacilli count in females and prevent them from ailments such as urinary tract infection, bacterial vaginosis, and yeast infection.